Lawrence Smith, Keeper Emeritus of Japanese Antiquities, British Museum, London. There are three reasons why I rejoice that the Kodaiji is displaying paintings by Fukao Rikizo in its famous and historic interiors. One is that he is an important artist whom I have long admired. Another is that I believe his works are very well suited to the traditional Buddhist context in which they will be shown. The third is that this exhibition will mark a meeting of Japanese and international cultural strengths in a unique and important historical moment. It is now some years that I have followed and written about the artistic career of Rikizo, and from the beginning I always admired the physical balance in his paintings, a balance which seemed to get more assured as the physical scale of the works increased. By the term 'balance' I mean that sense of an inevitable relationship which seems to exist in each work between the shapes which appear on it. Of course in one sense that happens in every successful work of art, but in a more Japanese sense I believe that Rikizo's balance is closely related to that of the calligraphy of East Asia. In fact, one of the first things I noticed about his work was how closely the persistent elongated shapes, often in black, reminded me subtly of the strokes of kanji, often abruptly changing direction as so often happens in kaisho. Indeed, his large panels often give the impression of being an exploration of a written character perceived as if in a dream. This is one element that makes his work fit so harmoniously into the intensely Japanese environment of Kodaiji. 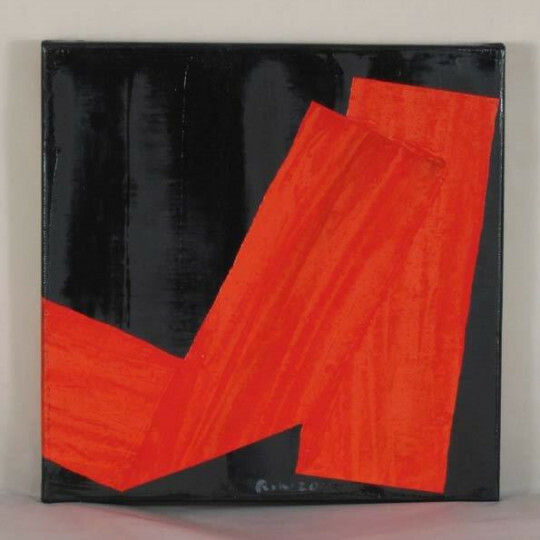 It might be objected that the essence of sho is black on white, whereas Rikizo's paintings have mostly been black on red, or black on blue or green, or more recently red on red. But this would be to miss a wider context, for these are all tensions between opposites, dark and light, existence and void - the preoccupations of all major religions and philosophies. Rikizo's works explore these profundities, as do all serious artists in their various ways. It is no surprise to me that they have been considered suitable for a great Buddhist temple. And further, visitors to the exhibition will notice that none of his red or black surfaces are flat. Like the gold-leaf backgrounds of traditional fusuma-e and byobu, they are complex and varied in texture, picking up different aspects of the changing light as the day progresses. This is a visualisation of that transience which is at the heart of Buddhist thought, and which finds a specially Japanese expression in the word aware. Furthermore, it will be noticed that all Rikizo's works are both still and in movement. They always lead the eye outside the physical constraints of a three-dimensional canvas into wondering what happened before, and what will happen next. Indeed, some of them stray outside the borders of the canvas, as if challenging its own physical reality. This partakes of both transience and the immediacy of what we experience, and this too is at the heart of all serious art. So far I have spoken of the art of one particular artist. But in this exhibition there is something very specific which has not happened before, and as a historian of art I believe to be most significant. It is not the fact that purely abstract paintings have been chosen for a Buddhist temple, for this has happened before, though not frequently. It is rather the fact that, extraordinary though it may seem after 150 years of the vigorous and distinguished pursuit of western-style oil-painting by Japanese artists, this will be the first time that paintings in these techniques on canvas have been used in a traditional religious building such as Kodaiji. Up to now, only paper or silk have been used. For this exhibition, Rikizo has laboured to make works which can be adapted as fusuma-e, kakejiku, and even small byobu-e. This has required imagination and ingenuity not only from him, but also from the hyogu-shi, and of course from the temple authorities themselves. This is a historic meeting of two great artistic traditions. It is a bold decision, but it will be beautiful and memorable, and I predict it will be remembered not only as a imaginative and courageous experiment, but rather as the beginning of a rich new school of Japanese art.